My mother's sister, my Aunt Charlotte, just turned sixty. (Hooray!) While every moment you clock here on earth is reason enough to celebrate, I really like that we take note when people hit their zero birthdays. My cousin and her husband very generously hosted a family dinner at The Melting Pot on Friday night to celebrate Aunt Charlotte's birthday. We talked; we toasted the birthday girl; we enjoyed the slow paced dinner. 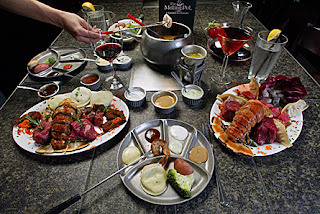 We dipped our bread into different cheese, then we dipped our steak, lobster, pork, chicken, shrimp in cooking oil, and then we dipped cake and strawberries into various chocolates. It was a festive night. I'm paraphrasing but at one point after several toasts were made in her honor, my aunt stood up and said: "Maybe I was a good mother; maybe I made a few mistakes as a mother, you'll have to ask my children, but I hope my children always felt loved. I hope my children always felt encouraged to explore their passions. Today on my sixtieth birthday I know, my richness, my wealth comes from my children and grandchildren. I love you all so much." I loved that toast. It echoes the driving principals of my life: When it's all said and done the only thing that matters are the relationships you have with the people you love.